Did you know that many of the databases, catalogs, and even popular web sites you use for research incorporate quick citation tools to make your life easier? Links may be labelled variously Cite (EBSCO and ProQuest databases, Google Scholar), Cite/Export (UW WorldCat), Citation Tools (Gale databases), or Cite this page (Wikipedia), but they all offer quick cut-and-paste citations in the most common formats. Below are three examples of these "Quick Cite" tools. Best practice is to always check over and correct the data from quick citation tools, since individual citations often have small omissions or formatting errors. 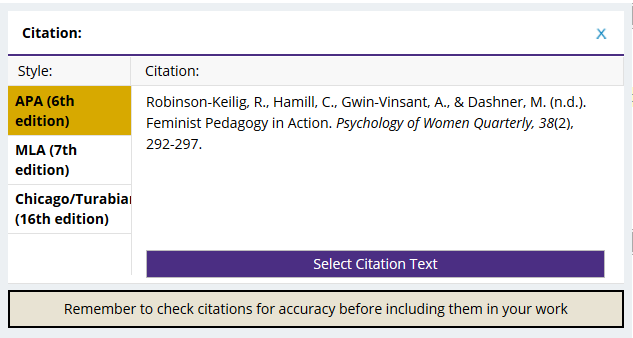 You can get a citation for an individual item in the new UW Libraries Search in MLA, APA, or Chicago/Turabian formats. Click on "Share/Save" in the right-hand corner of the record. In the drop-down that appears, click on "Citation." A window will pop up with the citation (see below). 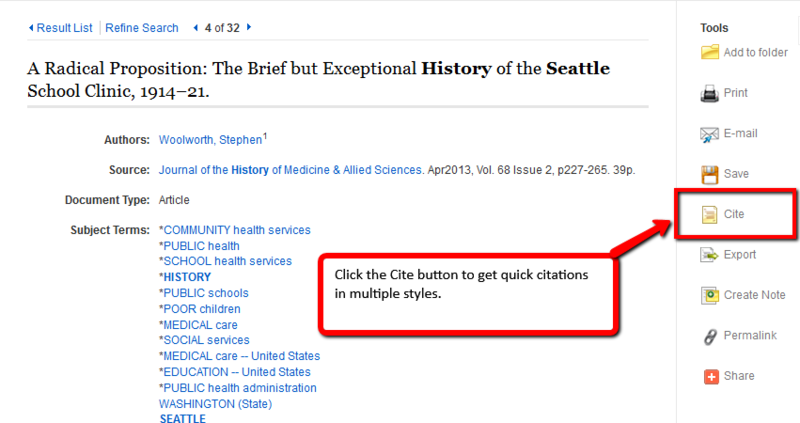 Choose a citation style by clicking on the left-hand side, then copy the citation and paste it into your bibliography. Build a bibliography instantly from any computer or device, without creating an account or installing any software. Supports 9,000+ citation styles. From the team behind Zotero. Note: Best practice is to always check over and correct the data from quick citation tools, since individual citations often have small formatting errors. Commercial service owned by Chegg; only citations in MLA format available free. The EasyBib Bibliography Creator plugin to Google Docs is more fully functional than the website. Citation builder for MLA, Turabian, Chicago, IEEE, ASA, SSF, Harvard, and Vancouver styles. Covers a very limited number of source formats. Form helps build citations in 18 different styles for web sites, books, and newspaper, magazine, and journal articles. Paste a DOI, PubMed ID, ISBN or URL to generate a citation in AMA format. Free citation builder for government documents (APA and MLA styles only) from Arizona State University Libraries. A free legal citation builder for Bluebook format. Paste in the URL of a tweet and generate a citation in MLA or APA format.